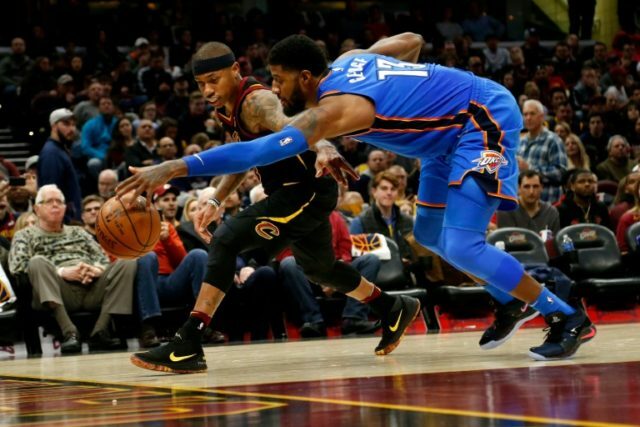 Los Angeles (AFP) – Paul George scored 36 points and Russell Westbrook dished out a season-high 20 assists as the Oklahoma City Thunder upstaged LeBron James and the Cleveland Cavaliers with a lopsided 148-124 win Saturday. George delivered at both ends of the court, scoring a team-high point total and throwing a blanket over James defensively to spoil the four time NBA Most Valuable Player’s attempt to become the youngest player all-time to reach 30,000 career points. The Thunder came out strong, scoring the first eight points by dominating the glass and attacking the rim. James came into the contest needing 25 points to get to the prestigious 30,000 total which would have made him just the seventh player in NBA history to reach the milestone. But the Thunder had other plans as James scored just nine points in the first half and finished with 18 on eight-of-17 shooting from the field. He also had seven assists and three rebounds before leaving the game for good with just over six minutes remaining in the fourth quarter. James finished seven points shy of the mark and will get another chance to surpass Kobe Bryant as the youngest in history to do it when the Cavs travel to San Antonio on Tuesday. Westbrook finished just one rebound shy of another triple-double, scoring 23 points and pulling down nine rebounds. Steven Adams scored 25 points on 12-of-13 shooting from the field and grabbed 10 rebounds for the Thunder and Carmelo Anthony finished with 29 points. George has been a welcome offseason addition to the Thunder lineup and an ideal compliment to 2017 league MVP Westbrook who is having another superb season. Neither of them was voted to next month’s all-star game despite the team having won four straight to reach 26-20 on the season after starting out 4-7. Isaiah Thomas scored team-high 24 points for the Cavaliers, who looked nothing like the team that has gone to three consecutive NBA finals. They did have six players score in double figures as Jae Crowder (17), Derrick Rose (12), Jeff Green (12) and Dwyane Wade (11) contributed in the losing cause. But the Cavaliers have now lost five of their last six games and nine of 12. They also seemed guilty at times on Saturday of trying to force the ball to James with low percentage passes. James could have attempted to hit the 30,000-point mark on Thursday when the Cavs hosted the Orlando Magic but he said at the time he preferred to do it Saturday when his family could be in attendance to witness it firsthand. Against the Magic, he scored an almost season-low 16 points, made just two free throws and turned the ball over six times. He has made just four free throws in his last two games.